Grill, broil, and more! 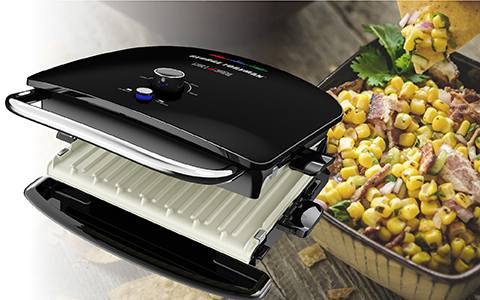 The George Foreman® Grill & Broil is the latest innovation in fast and simple at-home cooking. 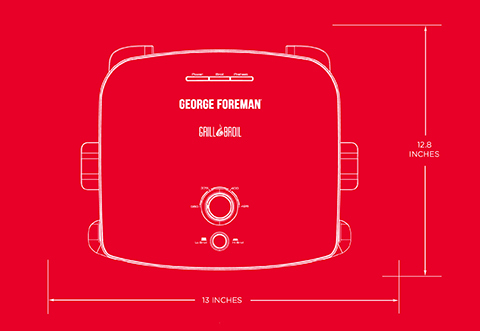 It takes the classic George Foreman® contact grill and combines it with the convenience of countertop broiling. Use the broiler to add delicious caramelization to steak, fish, and more; or finish off a top melt or open-face dish. 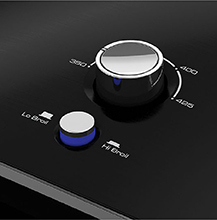 The unique 1.5” grill hinge allows the infrared heating element to sit above food for precise broiling results. Adjustable temperature controls let you broil at high or low, and set the perfect temperature for grilling and toasting all your favorites. 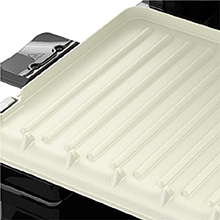 Plus, the removable grill plates feature a nonstick ceramic coating that’s 5x more durable* and dishwasher-safe for easy cleanup. 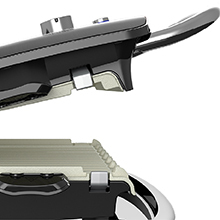 The cool-touch handle extends out from the grill so you can safely lift the grill top when grilling and broiling. Perfect for caramelization and top melts! Simply remove the top grill plate to reveal the infrared heating element, and choose from high or low broiling temperatures. 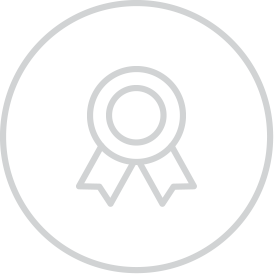 Grill & Broil, 4-in-1 Electric Indoor Grill, Broiler, Panini Press, and Top Melter - Black is rated 4.7 out of 5 by 26. Rated 4 out of 5 by Cmstkf23 from Great pressed sandwiches and quick cooking I received the George Foreman 4 in 1 grill and couldn't wait to try it. I made a few grilled pressed sandwiches and loved the crispiness and how pretty the grill marks were. It was like I just left a sandwich shop. I then decided to try a steak since my son loves them and my husband isn't always off work early enough to grill. Well I followed the timing instructions in the user guide provided and total disaster. The steak was overcooked and tough. No color which could be used error since I didn't use the broiler to add color. I haven't given up yet. I will try again and I think once I'm more comfortable using it I will master the indoor grilling aspect of the product. I love that it's portable and easy to clean. Rated 5 out of 5 by Shelly from Fast and easy! I love the George Foreman Grill & Broil 4-in-1! It has helped me make lunch and dinner fast and easy! When I first opened I noticed how big it was. I first I thought I didn't like the size but after cooking on it the size is perfect! I feed 4 so I love that it's bigger then the last George Foreman I had. I have I great space for it under my cabinet when I'm not using it but that's not often. I've made chicken, paninis & hamburgers on it and they all have come out delicious and we're made fast. I loved the grill marks it left on the paninis! It also has ajustable temprature control (a high/low setting) so I was able to cook my food at an appropriate temperature. We also love that it heats up fast and has an indicator light to let us know when it's ready! When of my favorite parts of this is the easy clean up! The ceramic plates that cook the food are removable dishwasher safe! Like I said I love it because it's fast and easy!! We highly recommend! Rated 4 out of 5 by Candim from Love the broiler I hadn’t used a George Forman grill in close to 10 years, but this one is very nice. I like that the grill plates come off easily for cleaning and the top one can stay off for use of the broiler function. I’ve even used the broiler for reheating leftover pizza and wings. It’s made well and looks nice. Rated 5 out of 5 by Skamp16 from Amazing so far I love how many things you can use this for! We grilled some sandwiches, then ttried just broiling then, ive grilled veggies on it, and already made some burgers. This is a great kitchen appliance, and can let me grill things inside easily without having to use a barbeque. It seems durable, super easy and straightforward to use, and I like that there is a drip pan to catch all the grease and juices. I love this and I would rrcommend this to anyone. Its also really easy to clean which is a huge added bonus. 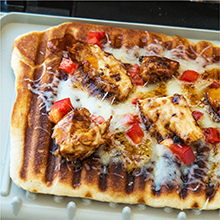 Rated 5 out of 5 by Dannil from Easy to use This George Foreman grill is versatile, easy to use, perfectly sized, and it looks great so you can even leave it on your counter. Living in New England you can really start to miss the taste of grilled food so I pulled out the grill to cook some classic burgers and hot dogs. The food tasted great and the grill was so easy to use. The plates came off so the clean up was very easy too. The surface area is a little small for a big family but worked great for a family of 4. 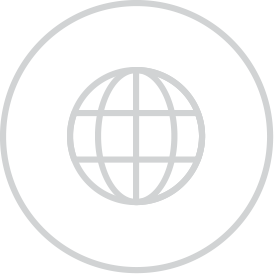 Rated 4 out of 5 by Cassek1 from Great Product !! I got this free in return for my honest review. I owned the original George Foreman grill when it came out and let my just say this is definitely an upgrade. This grill works great for chicken, steak and you can even make sandwiches on it. My only complaint would be that it is very large. You can barely lift the lid all the way up under the cabinets, and storage is a problem for people with not much cabinet space. Overall if you have a pantry you can store it in I would definitely recommend it. Rated 5 out of 5 by Michelle70817 from Love it! I love this George Foreman grill. It works fantastically for grilling burgers when it is rainy and cold outside!